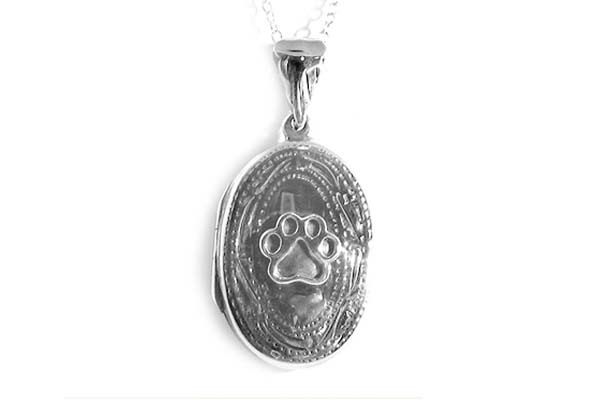 A large sterling silver oval locket with Puppy Paw® that can hold photos, a puppy tooth, cremains or a lock of hair of your beloved pet! Comes with an/18", sterling silver necklace. This Puppy Paw® can even be made into a Mother's Paw® that can hold 7 birthstone crystals! AND we'll add a photo of your pet for FREE. SS Oval Memory Locket w/Puppy Paw®. Comes w/an 18", sterling silver necklace. To add a FREE photo (or 2) just place your order, then, send your image by mail, or, by email to Puppy Paws, 6763 Stafford Dr, Mayfield Heights Ohio 44124! A small lock of hair or cremains need to be sent in the mail. By mail send your image at a high 300dpi to info@puppypaws.com with your name and invoice number. Original photos will be returned with your locket. I will send you the mailing instructions for sending cremains.